In this path-breaking book Linda Colley reappraises the rise of the biggest empire in global history. Excavating the lives of some of the multitudes of Britons held captive in the lands their own rulers sought to conquer, Colley also offers an intimate understanding of the peoples and cultures of the Mediterranean, North America, India, and Afghanistan. Here are harrowing, sometimes poignant stories by soldiers and sailors and their womenfolk, by traders and con men and by white as well as black slaves. 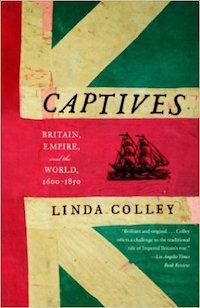 By exploring these forgotten captives – and their captors – Colley reveals how Britain’s emerging empire was often tentative and subject to profound insecurities and limitations. She evokes how British empire was experienced by the mass of poor whites who created it. She shows how imperial racism coexisted with cross-cultural collaborations, and how the gulf between Protestantism and Islam, which some have viewed as central to this empire, was often smaller than expected. Brilliantly written and richly illustrated, Captives is an invitation to think again about a piece of history too often viewed in the same old way. It is also a powerful contribution to current debates about the meanings, persistence, and drawbacks of empire.